Mould is everywhere. But how much do we really know about it? It often goes unnoticed in corners where we don’t tend to look, yet the fascinating (and potentially deadly) species of fungi is actually quite interesting when you inspect a little closer. That’s why today, we are sharing nineteen of the best facts about mould that you probably don’t know – as well as links to environmental site assessments to fight mould infestations. Mould grows on virtually everything – including the food we eat! Cheeses such as gorgonzola, camembert, brie, and blue cheese are all processed with mould, either within the cheese itself or on its outer surface. Many people use the two terms interchangeably, causing some confusion about their differences. While mould and mildew are both types of fungus, they are actually two separate species. The main difference between the two is that mildew is a surface fungus that can be cleaned with supermarket cleaning products, while mould can penetrate surfaces and must be removed by professionals. Mould has a naturally-occurring defence mechanism known as mycotoxins. These are tiny particles within mould spores that affect human health, particularly in large amounts. A particular mycotoxin known as the ‘T-2 Mycotoxin’ was suspected to have been a major ingredient in the deadly ‘yellow rain’ that was sprayed predominantly during the Vietnam and Cold Wars. Yellow rain caused a number of horrific symptoms, including bleeding from the nose and gums, seizures, blindness and even death. However, scientists later discovered that yellow rain contained high levels of pollen and was likely to have been bee feces, not the T-2 mycotoxin. Because mould produces spores that are easily inhalable, sufferers of asthma may find their symptoms worsen when they are exposed to damp areas that contain mould. Those who suffer from asthma can help to mitigate the risk of an asthma flare-up by ensuring there is plenty of ventilation, and drying any dampness as soon as it appears. A study conducted by Brown University in the U.S. found that residents living in “visibly damp, mouldy households” were up to 44% more likely to be at risk of having depression. Residents included in this statistic were also more likely to display depressive symptoms if they perceived that the mould could not be removed or controlled. The scariest thing the study revealed was that these risks are associated with mild and moderate mould exposure (not high exposure). Mould spores can enter your home in all kinds of different ways: through the vents, windows and even air conditioning systems. From here, they can attach to many different types of organic materials, from paper to fabric. Virtually the only thing mould needs to grow is moisture and/or humidity. 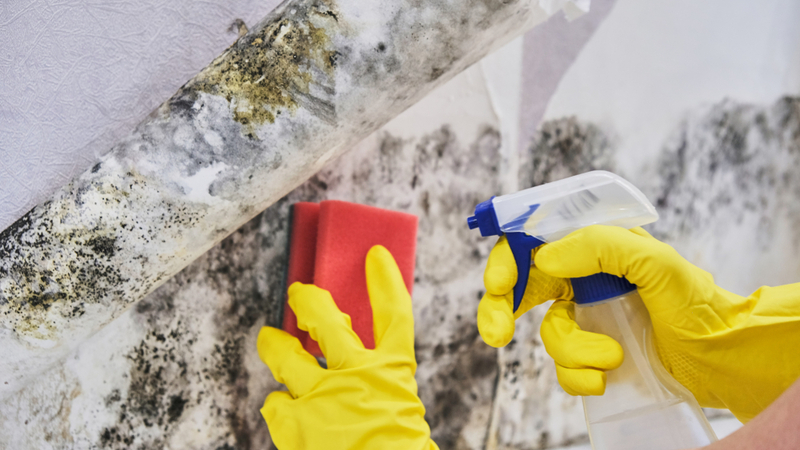 As long as there’s moisture in the air or dampness on a surface, mould can grow on paints, insulation, cardboard, clothing and wallpaper – to name a few places. Incredibly, there are over 100,000 species of mould in the world. Harmful mould is typically grouped into three different categories: allergenic, pathogenic and toxigenic. Allergenic (as the name suggests), produces and encourages allergic reactions. Pathogenic mould causes problems for those who suffer from acute illnesses. Finally, toxigenic mould is the kind that produces toxic spores, which can trigger serious health issues. Although there are plenty of paints on the market that claim to kill mould, it is impossible for paint to remove the mould spores that trigger an infestation to recolonise. If you do decide to paint over mould, you will notice that in just a few weeks’ time, the paint may begin to bubble and crack due to the mould growing beneath it. In some cases, exposure to high levels of mycotoxins can even be fatal. Modern construction favours the entrapment of heat to maintain a steady temperature, thereby saving on electricity costs. However, this also means that humidity can become trapped in the home, creating the perfect environment for mould to grow. Avoiding this is relatively simple, however. Just make sure there is plenty of natural ventilation where possible, or invest in a dehumidifier if you live in a particularly humid area. Mould can develop on a damp or moist surface within just 24 hours. That’s why it’s so important to ensure that you try to seal leaks and dry surfaces as soon as possible. This can be particularly hard if, for example, your home has recently been flooded, however, our comprehensive guide to post-flood mould control shows you the steps to dealing with this situation. Did you know that mould has helped save millions of lives? While it is true that mould is often bad news for your health, certain kinds of mould (such as penicillium mould) have helped push the medical world forward. Penicillin was one of the first medications to be effective in fighting against bacterial infections. It is estimated that penicillin has helped to save 200 million lives since 1942, when it was first used as a medicine. If mould is left for long enough, the infestation can become so severe that it is actually more efficient to tear down the entire home rather than remove it. While that is a more extreme example of what can happen if your home gets infested, serious mould colonisations are still detrimental for the value of your home. Not only can it lower the functional appeal of the home, but the potential repair costs can cause the home value to plummet. It is a common misconception that bleach and store-bought mould removers will kill mould. These agents only remove the appearance of mould, helping you believe that the infestation has been cleared. In actual fact, however, bleach and agents from the supermarket that claim to kill mould are ineffective at killing spores. The spores left behind after you’ve sprayed the area with bleach will typically reappear and very soon you will be back where you started. In 1922, King Tutankhamen’s tomb was discovered by a team of archaeologists. The dig was sponsored by Lord Carnarvon, who died shortly after the tomb was opened. This led to the rumour that the opening of the tomb triggered ‘King Tut’s curse’. However, after the existence of a curse was dismissed, researchers took to studying what exactly could have caused Carnavon’s death. They found that mummies carry various kinds of mould from the Aspergillus variety. The ancient tomb walls also carry other varieties of harmful mould. However, despite the fact that archaeologists were (and still are) exposed to mould spores, it was eventually concluded that Carnavon’s death was due to his own health problems. Mould and its spores are microscopic, which is a huge reason it often goes undetected. It can also grow in places that may not be visible in daily life – such as beneath the wallpaper. It’s likely that you will still be able to detect a mould infestation, however. This is due to the incredibly musty and damp smell that it emits, causing the room to smell earthy. If you have noticed this in your home or building, it is important to book environmental site assessments right away. If you’ve ever noticed that your allergies seem to spike when Christmas comes around, it could be because mould is growing on your live Christmas tree. Once you buy a Christmas tree and bring it home, the indoor temperature and moisture levels can invite mould to grow quite quickly. Of course, the problem is easily fixed by purchasing a synthetic tree instead. Certain types of mould – such as brown spongey leaf mould – can form a fantastic mulch for the garden. In fact, some gardening aficionados even spend years making their own leaf mould to use in their potting mix and compost. This is because leaf mould is said to dramatically improve soil structure and even boost its water retention abilities. We’ve established that you cannot remove mould using bleach or paint – so how can you? Unfortunately it is not as simple as whipping out a bristle brush and scrubbing until you can’t see any more mould. (In fact, this actually makes the problem worse, as it spreads spores into different directions). The only way to truly remove a mould infestation is to book environmental site assessments and have professionals treat the issue. The only way to know if you have a mould infestation in your home or building is to book environmental site assessments with professional environmental consultants. Professionals can identify and diagnose the problem, leaving you feeling confident that mould will not continue to affect your health and wellbeing. Alpha Environmental are environmental consultants based in Melbourne. We specialise in environmental site assessments for mould, asbestos, and groundwater. We also conduct environmental site assessments for contaminated soil testing and demolition sites. To find out more about our services, please do not hesitate to get in touch through our enquiry form or by calling 1300 039 181.